The partnership between Saskatchewan Polytechnic School of Nursing and the University of Regina Faculty of nursing developed vision, mission, and values statements to guide the development of the CNPP. VISION: To advance health care practice through nursing education leadership. MISSION: To anticipate and respond to changing nursing roles and health system needs by preparing graduates who demonstrate leadership and excellence in practice, research, education, and administration. Relational Ethics. Creating an ethical, caring space in understanding the patient’s unique life context, including values, beliefs, needs, and wants. Patient Safety. Preventing and mitigating unsafe acts within the health care system to assist patients to achieve an optimum level of health. Cultural Safety. Examining the complex, historical, political, social, cultural, and economic structures that influence health, social relations, practice, and power relationships. Using an action-oriented approach to move the nurse practitioner and patients from unknowing to knowing. Collaboration. Developing a unique relationship with patients and other interprofessional care providers to provide optimum patient care. This to ensure continuity of care when identifying conditions requiring management outside their scope of practice and collaborating with other providers to ensure patient needs are met. Scholarship. Continuous inquiry processes undertaken and underlying every decision. Innovation. Fostering an environment in which new ideas can emerge and lead to creative approaches, solutions, and actions. The CNPP development team utilized a rigorous process to develop a conceptual framework to guide curricular and program design. Initially, conceptual frameworks used by educational programs across Canada and the United States were examined. After much deliberation, the committee identified that the “Strong Model of Advanced Practice Nursing” was useful (Ackerman, et al., 1996; Winnipeg Health Sciences Centre, 2008). The Strong Model is recognized as a valid and reliable model for depicting the dimensions of the advanced practice role in an international contemporary health service context (Chang, Gardner, Duffield, & Ramis, 2010, 2011). However, the model is primarily focused on practice education and the language did not effectively reflect the Saskatchewan/Canadian context. 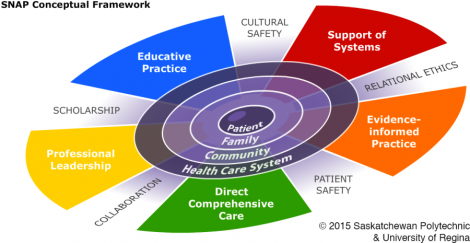 Thus, the model was adapted to create the Saskatchewan Nursing Advanced Practice (SNAP) conceptual model. The core concepts were redefined to logically fit the Saskatchewan health system context, contemporary literature and expertise of the faculty of Saskatchewan Polytechnic and U of R. Additionally, the concepts were evaluated to be consistent with SRNA Registered Nurse (nurse practitioner) RN(NP) Core Competencies (2010) and academic and clinical domains for advanced nursing practice as set out by the CNA. The guiding principles from the Strong Model, Canadian Advanced Practice competencies, Saskatchewan and Canadian healthcare context, and SRNA NP competencies were incorporated to reflect the Saskatchewan Nursing Advanced Practice (SNAP) model as the conceptual framework for the curricular and program design of the CNPP. The conceptual framework guides advanced nursing practice. Admission criteria acknowledge that applicants have sound competence in registered nurse practice thus applicants know the core concepts central to nursing. Examples of core concepts central to nursing that are built upon in the program are primary health care, population health, collaboration, caring, communication, evidence-informed practice, critical inquiry, information literacy, leadership, ethical practice, professionalism and safety. The framework reflects advanced nursing practice national and provincial competencies and standards. The CNPP defines advanced nursing practice as an advanced level of clinical nursing practice that maximizes the use of graduate level educational preparation; in-depth nursing knowledge; and expertise in meeting the health needs of individuals, families, groups, communities and populations. This involves analyzing and synthesizing knowledge; understanding, interpreting and applying nursing theory and research; and developing and advancing nursing knowledge and the profession as a whole (SRNA, 2010). The NP is defined as a registered nurse with graduate level educational preparation and experience who possess and demonstrate the competencies to autonomously diagnose, order and interpret diagnostic tests, prescribe pharmaceuticals, and perform specific procedures within their legislated scope of practice (CNA, 2008). The role is derived from blending clinical diagnostic and therapeutic knowledge, skills and abilities within a nursing framework that emphasizes holism, health promotion and partnership with individuals and families, as well as communities (CNA, 2008) balanced with systems acumen, educational commitment and leadership. The competencies and expectations of this role are well situated in the SNAP model.